It’s very interesting to see the origins and development of new groups today. Take for instance Eufory – who started in 2008 as a Def Leppard tribute act, developing through the years into more of a power/heavy metal band. Hailing from Slovakia they’ve released a debut album Flying Island Eufory in 2015 independently before signing to Sliptrick for the follow-up Higher and Higher. Gaining Roland Grapow as the mixing/mastering maestro aids the sonic punch and professionalism present – and based on first impressions, these four gentlemen (and one lady) serve up eight solid originals plus a Motörhead cover that possess appeal for multiple generations. 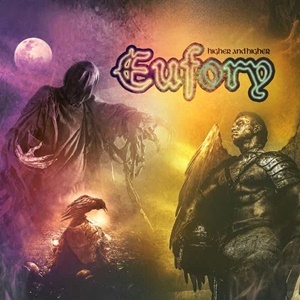 Eufory explores conventional power metal themes musically and lyrically that are cut from the Helloween and offspring cloth – resounding guitar riffs that display huge hooks, steady double kick supplementation, and choruses that leap off the speakers into the hearts of the audience for vocal harmonization. Heavier guitar sequences give opener “Dragon Hearts” that Evergrey crunch at times, but this is a fairly standard mid-tempo opener with Stratovarius charm – although the surprising off-time instrumental break adds an original touch. Requisite back and forth choir background parts and a closing piped in audience aspect allows “Louder” to be an early record favorite – while the start of a fire and keyboard orchestration sets the stage for “On a Pyre” – a 6:37 cut that contains playful melodies, acoustic guitars, and a theatrical atmosphere that shines in Helloween-like splendor. What’s most enjoyable regarding Eufory’s approach is the fact that they aren’t aiming to be the speediest, flashiest, or most technically brilliant band – they play within their comfort zones, build a solid set of riffs and ideas and develop them into memorable, individual songs. Check out the 80’s-keyboard flashes against cascading bass/guitar riffs within “Dancing Star” or the closing Motörhead cover for “One More F***ing Time” to see the varied dynamics that keep these musicians from stagnation. Emphasizing the melodic side of power metal, Eufory could be a new diamond in the rough that polishes into that shining star if you are willing to take that risk.